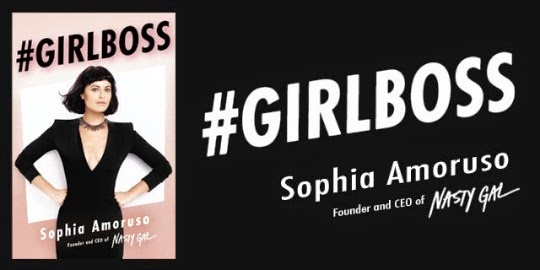 Earlier this Spring, Sophia Amoruso -Founder, CEO and Creative Director of the online fashion retailer Nasty Gal released her new book #GirlBoss. The book shares the fashion maven’s experiences, and tells how she went from dumpster diving and shop lifting to growing a million dollar fashion brand. #GirlBoss isn’t the first in it’s genre to be released as of late. Other popular books aiming to inspire and empower females to dive into the business world and profit from their passions have been hitting the shelves at record rates. Facebook CEO Sheryl Sandberg released her widely popular book Lean In this time last year, which also delivered an inspirational message to women ready to conquer all. However, it’s not the content, inspiring as it may be, of #GirlBoss that I’m recognizing as genius. It’s the awesome PR and marketing campaign surrounding it that I want to celebrate. First, the title itself. Adding a hashtag into the title of your book equates to instant free marketing and increased exposure every time your book is mentioned. Even the this post, when shared over social, will link to the infamous hashtag, further spreading awareness. PR specialists who work with authors and publishers to promote printed content work hard to get a conversation started over social media. Sophia has cut out this extra leg of work by starting the conversation in the title -why didn’t anyone think of this sooner? In addition to its conversation-starting title, #GirlBoss has an impressive amount of online content on its website. Loaded with everything from promotional videos, photos and blog posts, the website truly extends the books conversation, making viewers even more compelled to find out more about Sophia and her story. #GirlBoss is not just a book, a hashtag or Sophia Amoruso’s rags to riches story. According to the book description, “A #GIRLBOSS is in charge of her own life. She gets what she wants because she works for it.” #GirlBoss is what every young woman has the desire to be -inspirational, successful, stylish and purposeful. Not only has Sophia told and sold her own story, she has given women a new framework to create and share their own stories. Creating a personal tie between your message and the lives of your audience members is no easy feat, and what every PR pro aims to do. Sophia and #GirlBoss have managed to achieve this is fabulously. Have you heard of or read #GirlBoss? How do you think this book will change the way print materials are marketed in the future? The company I work for has been looking into a PR firm to help them with some issues. I have no idea what criteria that they are looking for. But I hope it solves our issues.